I had started a project a few months back to try each of my lenses for a week and report on how well they, and I did. I’m ashamed to admit that since then I have only been able to do so far three additional lenses, since the 50mm, and obviously have not been reporting back on them. As my title says, life can get in the way of resolutions and I let that happen to me. Well spring has started to finally appear, don’t let the calendar fool you, it was 28 degrees here last night and daytime highs have barely broke 60. And with spring has come a renewed determination to get on with my resolutions. The next in my lineup for testing was my 28mm f1:2.8 manual focus lens. I had learned in my 50mm lens test that my hands were a little shaky. So instead of using the 28mm on my old Pentax DS, I used it on my K5. The K5 has shake reduction in the body and helped me stay stabilized while focusing. In the early days of 35mm film cameras a 28mm lens was considered wide angle. Most cameras were sold with a 50mm lens. Between 35mm and 50mm was considered “normal” viewing for the human eye. Many early zoom lenses started in at 35mm. Later years saw 28mm as becoming more common. By the time DSLR cameras were affordable the most common zoom lens sold with them was the equivalent of a 28mm lens. Both my 50mm and 28mm lenses are from the film era. On my Pentax DSLR cameras they give me the field of view of 75mm and 42mm respectfully that they would have on my film 35mm cameras. The first thing I noticed with the 28mm is that I was able to focus much closer to objects than I could with the 50mm lens. I stood no further away from this frog light than two feet. I then used the lens to do suburb-scapes photos both horizontal and vertical. I quickly decided that I preferred images from this lens in the vertical or portrait mode. For some reason the apparent field of view of 42mm held no appeal to me when done as a horizontal image. The other thing I noticed was that in areas of high contrast, such as the trees against this dull winter sky, this lens has noticeable chromatic aberration. This is apparent as a purplish colored “ghosting” along areas of high contrast. It is a phenomenon of the digital era and is brought about by a combination of high contrast and color wavelength. Most modern lenses have special coatings to aid in preventing it. I enjoyed working with both of these old lenses but am looking forward to my next prime lens. This one is more modern. My 35mm f2.4 auto-focus lens. Well I spent the last week working with my 50mm manual focus lens. At first, for fun, I used it with my old Pentax istDS camera. This was the first DSLR I had ever bought. As I had only been using Pentax film cameras and had built up a “stable” of lenses, it seemed logical for me to buy a camera that I could use them on. Although I did eventually buy lenses made for crop sensor digital cameras, I was able to save money at the beginning by buying only the camera body. I soon realized that my older lens, along with my older hands, could use some help. So I switched to using my somewhat newer Pentax K5 DSLR. The K5, like all of the DSLR cameras that Pentax now makes, has IBIS, internal body image stabilization. This allows the camera to compensate for my less than steady hands by stabilizing the image. On my crop sensor cameras the focal length of each lens is multiplied by a factor of 1.5. This made my 50mm lens seem like a 75mm lens. Much shorter than I’m used to for portraits and much longer than I’m used to for landscapes and still life. It was not an easy task finding ways to use that length of lens. The way I felt the most creative with it was in isolating interesting parts of a landscape. Perhaps the trail through the woods, or ice formed on a puddle. During a walk I found this small bit of water surrounded by a fence. The reflections were never quite still as a small breeze riffled the water. It took a few tries to get the look that I wanted. I found though that the lens had just the right length for me capture this image from the other side of the water. This not a lens I would chose as my only lens. In fact even though there are modern auto focus versions of this lens available, I will not be getting one. It is unable to do wide vistas. There is no way I can back off that much and still have anything recognizable in the image. It is able to do portraits if I move back far enough and then just crop the center portion of the image. Something I do not want to do. For still life I cannot get close enough, and again cropping is required to get to the image I was trying for, and then the angle of view might be wrong. But when I found that this lens performed best in isolating part of a landscape, using this lens was a pleasure. I had learned it’s sweet spot and no longer felt held back in creating images with it. It takes the right tool to do a job well, but sometimes you need to figure out what the right job is for the tool. I will definitely be hanging onto this lens. It’s fast and it’s sharp. Being an older lens, much older, it does have some issues in high contrast situations. But you never know when it might be needed. Say a pond as the sun is starting to set. “Make it do or do without, next steps” One of my photographic goals for 2016 is to see how much I can get out of the equipment I already own. Part one will be spending a week working with each lens that I own, trying to get the best I can out of it without any additions such as extension tubes. This will be done both handheld and on a tripod. For my first week I have started with an old manual focus 50mm f1.4 manual focus lens. I have chosen this lens not only because it had been my favorite lens from my days with a film camera but also because at f1.4 it is the fastest lens I own. So not only will I be needing to practice manual focusing again, I will have the opportunity to work with as narrow a depth of field as I can get. Because my camera is what is a crop sensor camera, all lens I use on it have a multiplication factor of 1.5. This means that my 50mm which was once a standard lens, meaning the field of view closely approximates that of the human eye, now is a 75mm lens. Basically this is because the smaller sensor in my camera has “cropped” out the center portion of the image changing how it is viewed. Part of the challenge of using a prime lens, one which has only a single focal length, is to use it to it’s best advantage. Do you get closer to try and fill the frame? Do you need to back up to try and get a unique landscape perspective? 75mm is slightly short for a portrait. Get too close and the subject suddenly has a big nose. Maybe having them turn slightly sideways would work better. I will first be working my way through my prime lens, one a week. First the 50mm as I said due to it’s speed. Then another older film era manual focus lens, a 28mm f2.8. After that will be a modern 35mm f2.8. Then a return to the days of film and manual focus with my 100mm f4 macro lens. that will be followed by the oldest lens I own, a Tamron adaptall 200mm f3.5. The prime lineup will conclude with a 500mm f8 mirror lens. After that I start the zooms, they include variable apertures 18-55mm, 18-135mm, 50-200mm and 55-300mm. And of course my favorite lens, the 70-200 f2.8. So there is the first part of my 2016 photographic resolution laid out. Along with my lens of the week I will also be working on some comparisons between zoom lenses that I own and learning focus stacking. As I have posted in the past, both here and on my Facebook page; Orchid Image Photography, I am a photographer and a birder but I am not a bird photographer. Bird photography is a world unto itself with a strong skill set and bank account to match. Lenses up to 600mm are not uncommon, along with cameras that have fast autofocus with good tracking abilities, and tripod/head combinations that can bear the weight of these beasts. On my shoestring budget I cannot afford the equipment needed for serious bird photography. And if I could afford it, I’m not sure if it is something I would pursue with enough passion to make the investment worthwhile. Although I have to admit to some jealousy when reading the Facebook pages of birding groups I belong to and seeing the beautiful photos of birds taken by the members. Then I looked at my own equipment and the The old New England adage of “Use it up, wear it out, make it do or do without” came to mind. I decided to try my hand at photographing birds using the equipment I already own. Since my current equipment doesn’t include a lens longer than 300mm I had two choices, crop closely or get myself closer to the birds. My first attempt was a red bellied woodpecker in some distant trees. It kept moving, but slowly. Even so, without using a tripod I was able to get only one usable image. I repeated this another three times with other birds. Some were closer in, but my success rate was no better than one or two in each group of six to eight images. My next series of photos I took were done using the same 70-300mm variable focus lens, handheld, but much closer to the bird. I stayed slightly hidden from one of my suet feeders and took a series of images as this downy woodpecker fed. My keeper rate was much higher with this method. I have done bird images with this same equipment in the past using a tripod. Looking back at those images I can see where I need to combine the techniques of being close and using a tripod. I won’t let my lack of the “proper” birding equipment stop me from taking photos of birds. I will just be sure that my technique gets the best out of the equipment I do have. 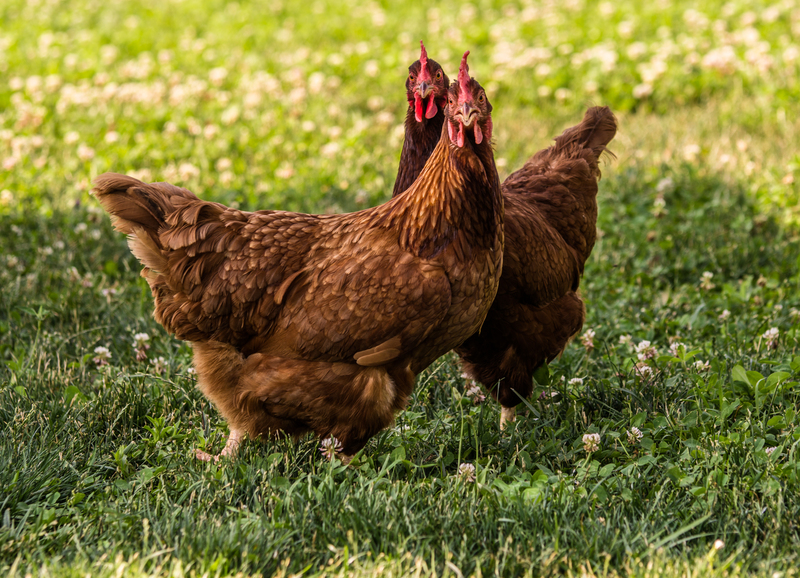 In my ever increasing search to gain experience in photographing all types of livestock I visited a small, backyard poultry farm specializing in free range eggs. 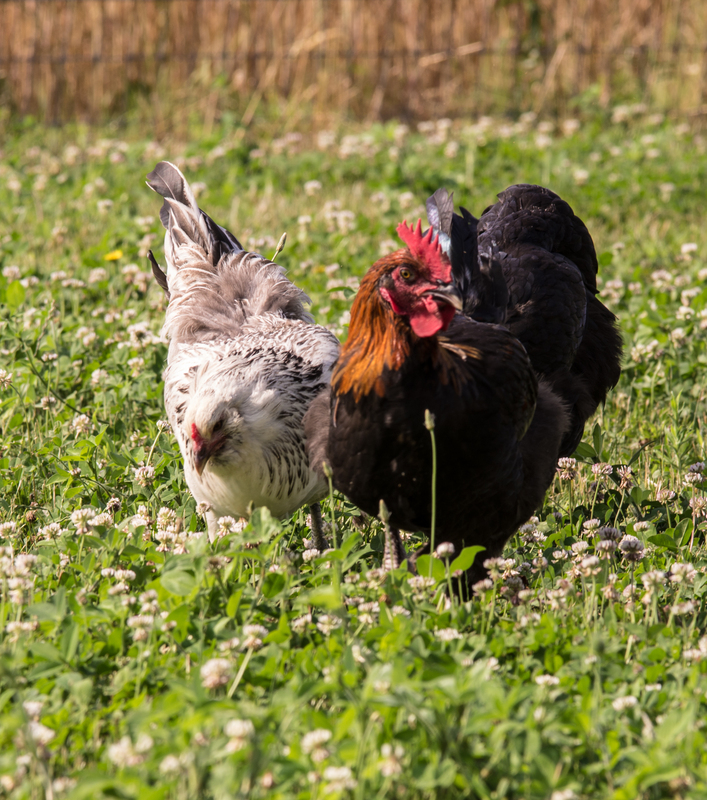 There a small mixed flock of laying hens, joined by four roosters, lived in relatively free range. 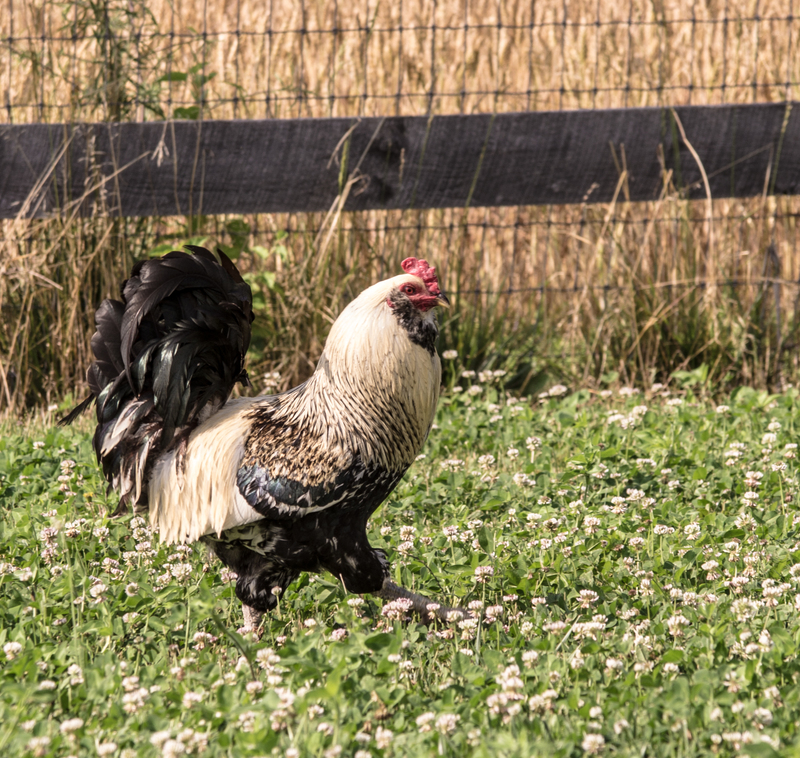 The owner had fenced in an area of an acre or so and added two open front large coops as well as waters and other fixtures needed for happy chicken life. Having learned my lesson in backgrounds I looked around and spotted the perfect area. On the other side of the fence where the coops were was a field of wheat. The coops were about fifteen feet apart. I figured that if I got down low, to chicken height so to speak, and shot fairly wide open, then the fence would be just a soft haze against the wheat. Problem is, you can’t pose a chicken and still have him or her look natural and free range. The solution came when the owner said she hadn’t fed them yet, which explained their crowding the coops clamoring to be given their food. I asked her to hold off on doing their regular feeding but instead to scatter some grain in the area between the coops. That almost convinced the chickens to more or less stay in the area I wanted them in. I say almost because there still those who had to leave and see if there was food scattered anywhere else. And chickens are fast. Even as they fed they more resembled a roadrunner than a hen scratching in the dust of a barnyard. 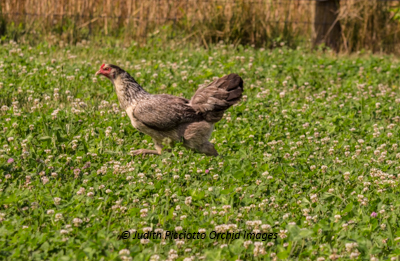 My first attempts earned me photos of fast moving chickens. Flawed in both focus and composition. Not the kind of image that would attract paying, or even non paying clients. Finally, as the sun grew warmer the chickens started to slow down. I was able to get images such as these. But then the sun grew too warm, I had been there an hour or so at this point, and the chickens decided to seek the shade. That left my best images to be taken there. I’ve watched folks herd cats. I even have herded a few myself. But for sheer frustration nothing beats photographing chickens. Sometimes, in the excitement of doing something different, you can forget the bigger picture, no pun intended. Well maybe a little pun. 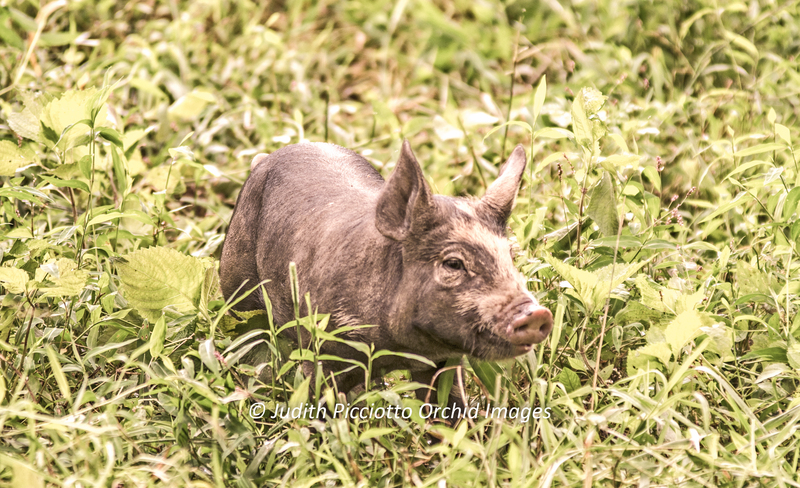 Last week I had the opportunity to photograph some hogs. Not Harley, but actual pigs. I had an invitation to visit a small farm owned by a delightful couple working hard to make their dreams come true. In the short time that they owned their farm they had cleared what amounted to a small landfill of trash left by former owners, built barns, built fences and bush hogged acres of stubborn weeds and overgrown briar. The pigs were in a good sized paddock, probably perfect from the pigs point of view. The front part of the paddock, closest to the house was flat. 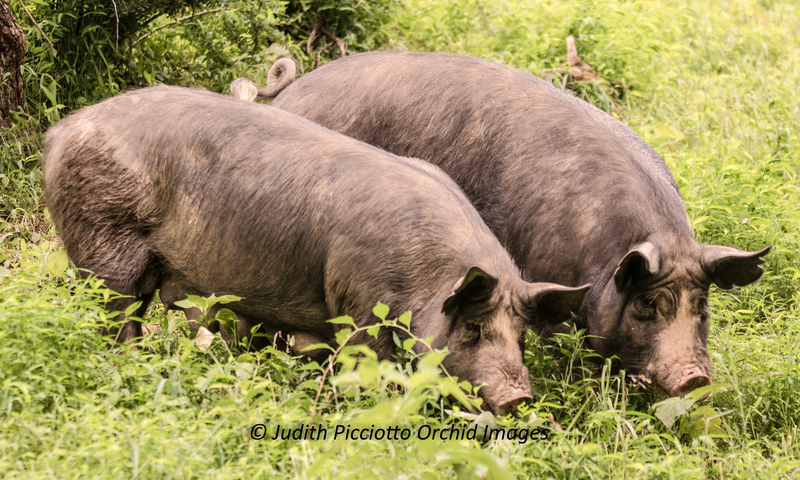 From there it sloped up along a lightly wooded hillside allowing the pigs shade while they rooted and grazed. corner of the paddock, furthest from the trees, would allow me the best light and views. Fortunately the fence was low enough to allow me to easily shoot over it. As the paddock contained two sows with litters along with a full grown boar, I had no desire to enter it to take the photos. Two things come to mind that, as part of the “bigger picture” I missed. I should have taken charge. I should have asked ahead of time what the paddock was like. And, I should have suggested using a temporary fence to partition off a section of the flat and nicely mown back lawn to place some of the smaller piglets in for photos. These adorable babies, referred to by their owners as “bacon bits” stole the show. There it is, a glaring white patch of nothingness ruining what could have been a wonderful photo. The phrase “White Sky of Death” is not my own. Years ago when I belonged to a camera club I had entered a photo contest, slide film, with the subject being a cemetery. I sat proudly as my slide was projected and heard a judge proclaim. “Too bad the shot was ruined by including the dreaded white sky of death” He then went on to explain how the bland white sky in the background ruined the shot by drawing the viewer’s eye to an expanse of nothingness. Despite many efforts, I could never seem to visit that particular cemetery when the sky was anything but a dull monotone grey. So I practiced focusing closer, filling the frame and using fill flash to make the headstones pop. But even though today I don’t take many pictures in cemeteries, I still sometimes forget to check the sky behind my subject. This is something that I find extremely frustrating. I should know better. I should have learned my lesson years ago, many times over. I should NOT have let this happen. The only thing I could think of to try and save the moment was to put in some sky from another photo. Not sure how well it worked though. In photography it’s all about the light. Without light we can take no photos, it’s that simple. It doesn’t matter if you are using studio light, natural light, or inside ambient light. Photography is all about the light. I know, I know, you also need something to be taking photos of. But, and trust me on this, the best subject in the world will not show up in your photo without light. This of course leads the discussion directly to lenses. Lenses are classified in two main ways. By their focal length, and by their light gathering ability. There are of course other factors such as how many elements they contain, how well the glass is coated to reduce flare and chromatic aberration.Focal length of course relates to the size of the lens, such as 50mm or 300mm.But, the real determination of a lens is it’s speed. The amount of light that a lens can gather. This measured by the maximum aperture, the amount the lens diaphragm opens when the camera shutter is pressed. The wider the aperture, the more light that can enter. In an entirely perverse manner, the smaller the number or f stop, the wider the aperture. Most folks with DSLR cameras start with the “kit” lenses. These are called kit lenses because they are the lower priced lenses normally sold together with the camera body as a kit. There are of course other lenses sold with cameras, especially the higher end bodies. But most of us probably started off with the older 18-55mm zoom lenses with variable apertures. The lenses whose aperture might start at f3.5 but ends at a f5.6, fairly slow for a 55mm lens. The problem is that lenses made with a constant aperture are of only two flavors. Your choices are either a prime lens, one with only one focal length, or if you prefer a zoom lens, expensive. Although I own and use prime lenses, I find a zoom lens to be a better choice for me when out in the field or at the beach. 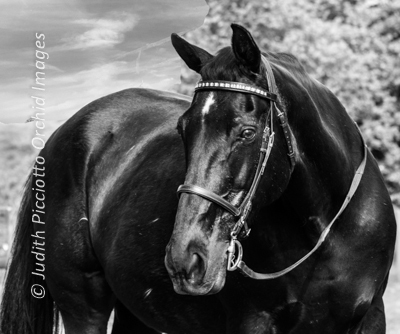 As most readers know, I photograph horses. the lens I have found most versatile for that is my 50-200mm zoom. The problem being, my 50-200mm is a variable aperture zoom. The more I thought about it, the more I convinced myself that I wanted a better zoom lens in that focal length range. To get a zoom range in that focal length I had three choices. Since I use Pentax cameras I could have waited and went with the new Pentax 70-200mm f2.8, except that lens has a $2299.95 price tag. Ouch. And being brand new to the market, not yet available used. Another choice was the Sigma 70-200mm f2.8, but that lens has been discontinued for Pentax K mount. It also has a motor driven focusing mechanism (as opposed to camera driven) which can occasionally malfunction. Since I would need to buy this lens used, my warranty options in case of a failure would be limited. My third option was the Tamron 70-200mm f2.8. Although it is considered to have a slightly slower auto focus speed than the Sigma, and to be slightly nosier when focusing, the Tamron was also considered to be the sharper of the two. Thus my choice was made. 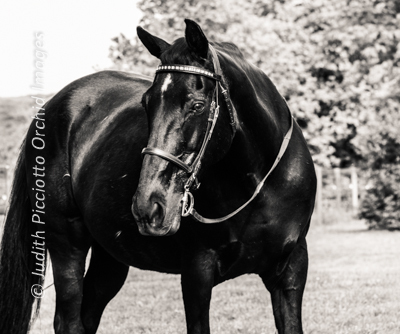 A used Tamron has joined my stable for nature and equine photography. It’s constant f2.8 will allow me to capture the scene in lower light, and of course it can be stopped down to a smaller aperture if I want to. Now I just need to get used to it’s 3.24 lbs weight. Thankfully it came with it’s own tripod collar. Stay tuned for more test shots soon. One Sunday in late November I went chasing. In other words a sighting of a rare bird, rare in the sense that it is “rarely” seen in my area, had me up going out to see if I could spot it. I had been sitting, sipping coffee and bouncing around the internet reading a little bit of this and a little bit of that. As always, I had Face Book open in a separate tab. This way if a family member, or a friend posts or sends me a private message I will see the notice in the tab header. Then it’s a simple matter to click over to that tab and see what’s up. I am also a member of three Face Book groups devoted to local birding. So when my little tab said I had a notification, and the notification told me of a rare bird sighting, off I went to chase it. 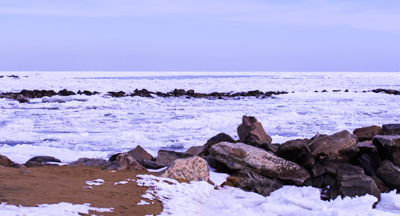 I live on the western shore of the Chesapeake Bay, which is considered the Mid-Atlantic region of the United States, at least according to the bird guides. The bird I was chasing was a Black-legged Kittiwake . Now, during their breeding season Kittiwakes are found much further north than where this one had been spotted. And the rest of the year they normally are found living out to sea, far from the of sight from land. It took me less than ten minutes from seeing the notification to being in full chase mode. Spotting scope, tripod, camera, binoculars, appropriate clothing for a bay side beach the last day of November, cash money to get into the park. The beach where the bird had been found was in a state park. During the off season there are no toll collectors and the the auto-lift gates at the entrance do not take credit cards. And soon I was in my car making the long five mile journey to the park. There I waited impatiently while the driver in the car ahead of me dug through his wallet and glove box to find enough money to get in. Finally I was in the park and a moment later pulling into a parking spot at the beach. First step, as always if the parking is close, I leave all the gear except my binoculars and camera and dash to the appropriate viewing spot. This allows me time to actually see the bird if it’s there,take a quick photo, and decide where to make camp. This time a friend of mine arrived just as I did and we walked onto the beach to look for the Kittiwake. No luck. But we did see a nice group of gulls, mostly sleeping and a Sanderling. The Sanderling was rare in itself as the poor thing should have already been in Florida. Obviously it had missed the memo telling it to fly south earlier in the year, As Black-legged kittiwakes look like gulls, until you see their black legs and facial markings, we decided to set up our gear and wait for the gull flock to wake up. After close to two hours of watching, waiting, using my camera off the tripod, I was close to giving up. More and more birders came as the word had spread. Always the same greetings. “Is it here?” asked by the new arrival. “Haven’t seen it.” answered by the slowly growing throng. And another birder joins in scrutinizing each arriving seagull with binoculars. Since I still had my binoculars out I decided I wouldn’t miss any bird action if I put up my spotting scope. So I put the lens and eye piece cap on the scope, took it off the tripod and closed it in it’s case. Now that it was protected the scope was carefully laid down and my camera went onto the tripod. I am not a bird photographer by any stretch. Don’t get me wrong, I am a very enthusiastic birder, and I do enjoy taking photos of birds, but a true bird photographer has much more talent than I do. 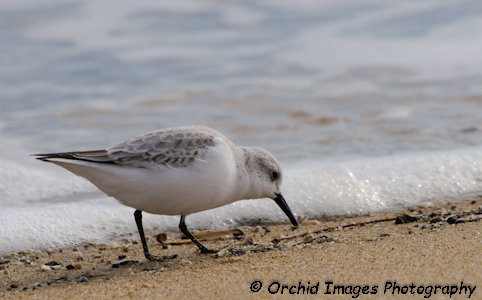 The Sanderling seemed oblivious to our presence and I was able to take many photos of it. The one I posted is my favorite but after looking at it closer I realized that my focus was in the wrong place. 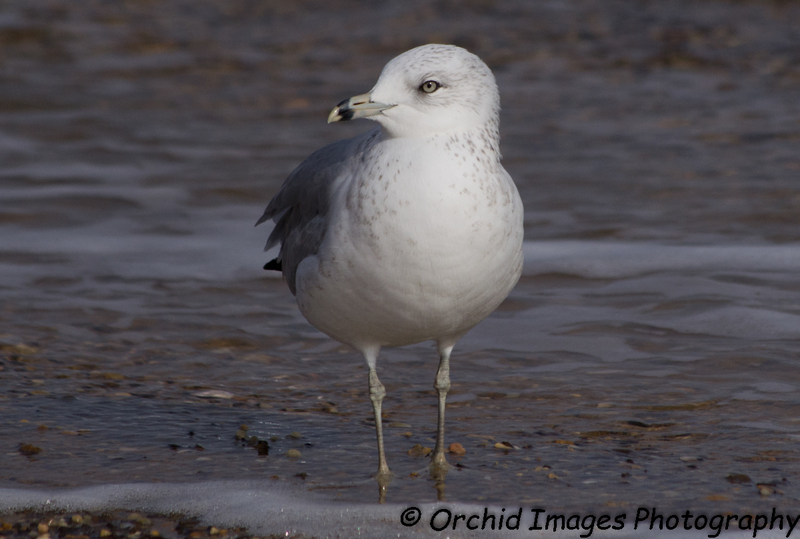 The ring-billed gull photo is, in my opinion, is technically more correct but the subject doesn’t “move me” as much. This wasn’t the first time that I have “chased” a bird only to have not found it. Last Saturday though I had better success. Not the best of photos but I didn’t have my tripod with me at the time. 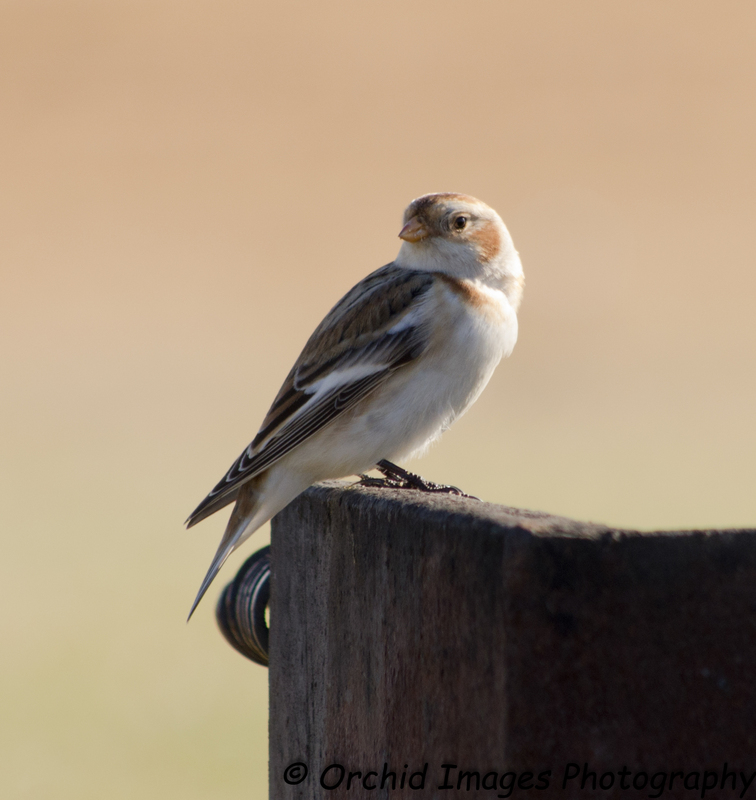 Meet the Snow bunting. A bird from the Arctic tundra who prefers to winter in the balmy south. Of Canada that is. Recently I have found myself totally blank of creativity. Photographer’s block as well as writer’s block has had me in their respective grip. I could blame it on the approaching holiday season. I could blame it on being overly involved with my day job. Finally I could blame it on depression. Not a major clinical type depression, but the down feeling blues that comes with the time change. Every November like clockwork our time gets turned back an hour. Suddenly I’m driving to work in daylight and driving home in the dark leaving me only weekends to relax outside, take photos, go birding. But mainly I blame it on myself. I haven’t even tried to push beyond it, until today. Well today I’m off work and it is raining outside. Not only is it raining but it’s predicted to change over to sleet and snow. Never mind that. Today is the day that I find a way to push beyond it all. The first thing I did was take my camera and go outside. My camera and two of it’s lenses are weather and dust resistant. I kept it under my raincoat though unless I was actually using it. 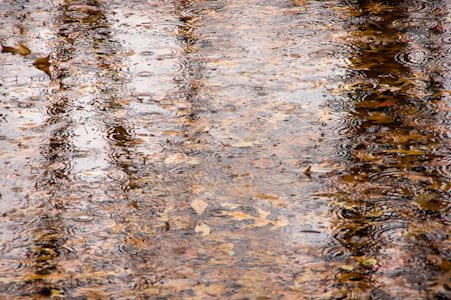 I must admit that my neighborhood in the rain doesn’t have much that is photogenic. But I did still try, and it felt good to be out. Well it seems the predictions were true. So in my newly determined state of mind I ventured forth once again with camera in hand. 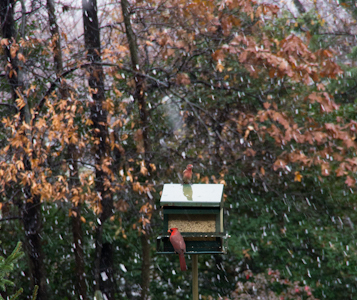 this time to try and capture the essence of falling snow. Snow photography is new for me. Despite having been raised in New England I now find the prospect of snow to be worrisome. An hours commute to work can do that to some. Especially when my day job is in health care and “snow days” are not allowed to be taken. My final photographic venture this day is to prove that the weather did indeed follow what the forecasters had said. Very shortly after the snow had started to fall the sleet followed. This varied precipitation had the predicted effect. From an area washed clean by a gentle rain, to one turning picturesque in the snow, I now have one that is just plain slush. Slush. What my photographer’s and writer’s block had turned my mind into. Neither rain no snow, neither black nor white, neither here nor there. Well despite the weather I’m determined to unblock my creativity and sallow forth camera in hand to capture what I see. As soon as the slush goes away.